The good news in the housing market continues to come in. This morning’s U.S. housing starts data for September show that at the national level, starts are at their highest level since the summer of 2008. I thought it would be a good idea to check in on Oregon housing starts. Data through August. 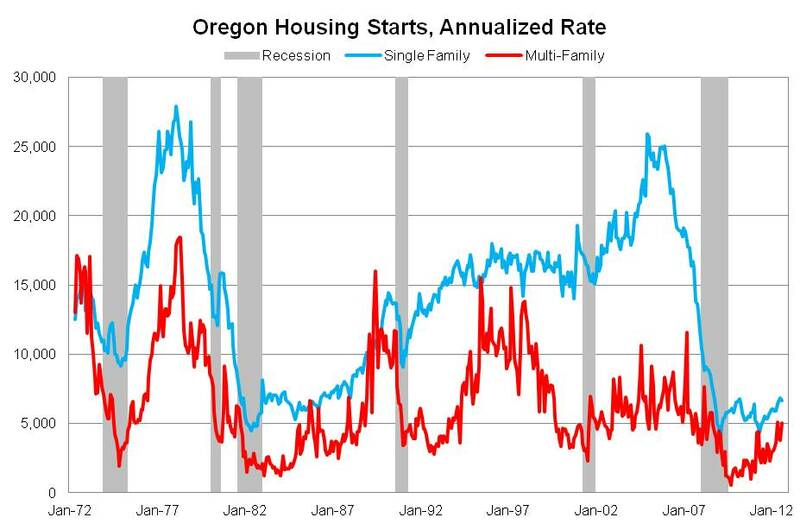 Like the nation overall, starts in Oregon are up considerably from their recessionary lows, particularly multifamily. The improvement in single family homes has taken a two steps forward and one step back approach, evidenced by the fits and starts pattern seen below. That being said, the current quarter is shaping up to be the strongest for single family starts since the end of the recession and expectations are for these gains to continue moving forward. It should be noted that the official state and metro housing data is related to permits and not starts themselves. Our office, in accordance with best practices, has a methodology of taking the monthly housing permits, filtering them over a number of months given that not all construction begins the same month the permit is issued and effectively converting the data into housing starts. While trends in housing are certainly positive and construction activity has generally been increasing for nearly three years at this point, it is important to step back and examine the larger picture. As Calculated Risk notes in the link above, U.S. total starts have increased about 80% from the bottom and single family are up 70%. 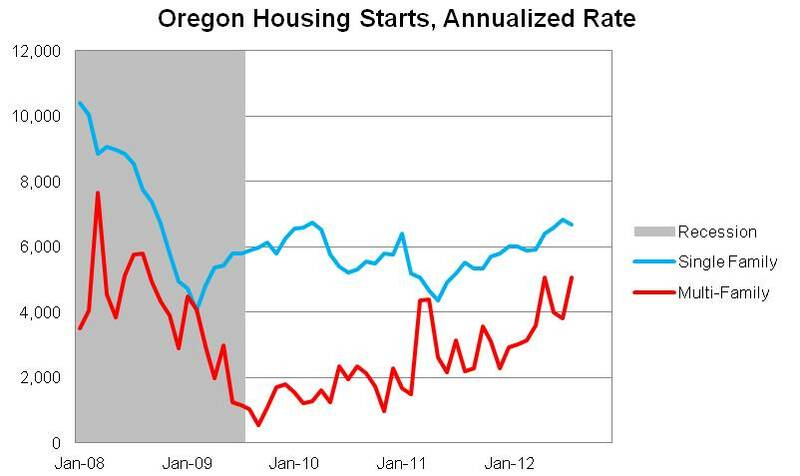 In Oregon the corresponding figures are a similar 80% gain in total starts and a 65% increase in single family, indicating that Oregon’s multifamily starts are increasing slightly faster than the national average. Today, new residential construction in Oregon is improving along with the economy overall. There is considerably room for further improvement before the level of activity approaches anything considered normal. Single family new construction in particular is currently about 45% of its long term average, while multifamily is doing better and is about 75% of its long term average. This end of the year is been really great for all the real estate around the world and it is a good news to hear that this one is continuing increasing.In Helsinki Finland most of the real estate increase their sales up to 25% which is awesome.